Love. Kill. Try not to die. Probably die anyway. 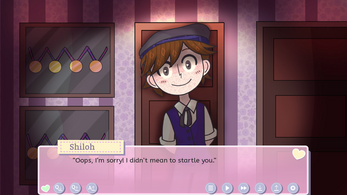 XOXO Blood Droplets is a cute, comedic, and creepy Visual Novel. 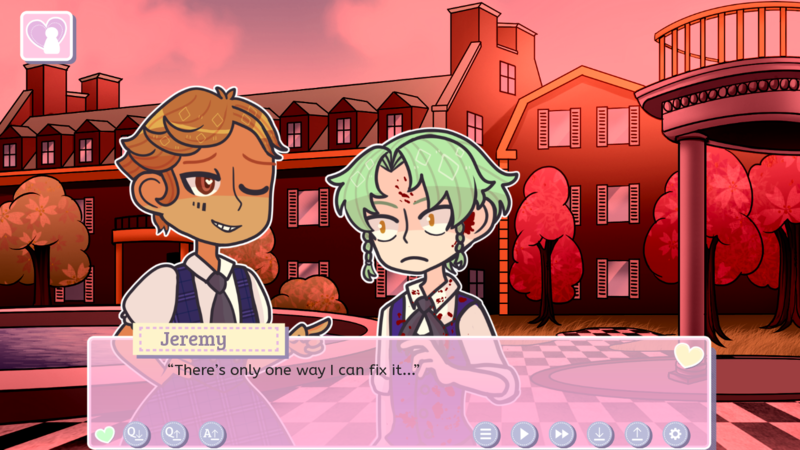 The goal is to somehow romance a murderous boy without having the crazy dudes you didn't pick (or even the one you did) end your life. It doesn't tend to go well. In fact, usually it's pretty horrific. JB has been attending the fancy boarding school Saint Sara Belle for almost a year now. Along with six others, she’s forced to join an after-school group created for students that are deemed ‘unfriendable’. JB is fine with that, especially ‘cause one of the awful people there is her special someone. It doesn’t matter that he has trouble getting along with people and is a murderer; he’s still perfect to her! No matter how many sparkly hearts consume her vision at the beginning, anything can happen in this place. The amount of twisted, winding ways the story can unfold is frightening. All you can count on for sure is that it will be crazy. XOBD is a spin-off to a lighthearted dating sim. The previously harmless romance guys are now exceedingly dangerous, but the protagonist is still quite fond of them and their insane ways. You do not have to play the OG XOXO Droplets for this game to make sense. Feel free to enjoy it as a stand alone story. Kickstarter Launch + Major Demo Update! I still love this game but, I feel like I should of been keeping up with it because after re-playing it, I couldn't for the love of me find prolougue endings #6 or #7 on top of this, I don't know anything about the storylines's #7 and #11 (since they, unlike the others, that have "#1 Coming Soon") have options but luckily, I'll be restarting the entire game (deleting save points, virtually erasing my memory, etc.) as soon as the new update comes out, sending positivity❤! Aw! Thank you so much. It's really nice to hear that you enjoyed the demo ^^! Haha, yeah, the new demo can cause some confusion if you played the original one. Starting a new file will probably help some! As a hint, Prologue Ending 6 happens without any of the main boy, so perhaps try not going along with them. Ending 7 is actually a mistake, aha. I didn't know there was a Prologue Ending 7 listed, but it shouldn't be there. I'm sorry about the confusion for that. Thank you! We are hoping to have games with more female LIs in the future :]. Aw the art style is so cute. It is a good game so far. I like this game a lot! The array of characters with different (but still insane) personalities is really fun. I appreciate the work you're putting into this game, it's really looking great. I can't wait for it to be released! This game isn't my cup of tea, but I do like it. 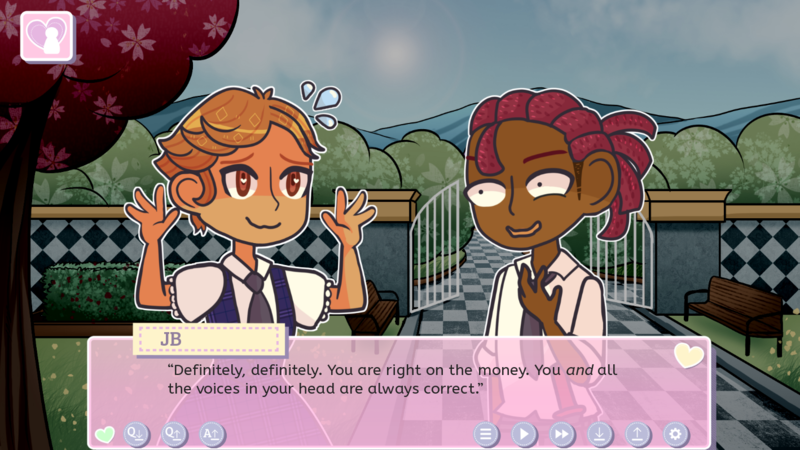 For me, I'm more focused and used to games that have cheesy, witty, romances (like the original XOXO droplets game for example). Although this game isn't one of my favorites, I do like it and wish you best of luck on it! Thank you for giving it a try even though it's not really your thing! Aaw, thank you so much! It's great to hear you enjoy it that much and I'm glad you like the sneaky, freckle boy :>. Hey, I'm sure this game has potential and it seems people enjoy it, and that's great! I'm personally not a big fan of the characters or artstyle, it seems like it's trying a bit too hard to pander to a certain audience- but hey, what do I know? I'm sure people will enjoy this game, so keep developing it! Thanks for giving a try! No worries that it's not your thing. Though, the notion that the XOD series is pandering at all just simply isn't something that's true. The original XOXO Droplets was a game no one asked for and to this day receives a lot of resistance. But we made it anyways and were lucky enough to find people who gave it a try and enjoyed it. After developing an audience who hoped for a real sequel, we instead came out with this: yet another game no one was asking for, including our own fans. We just do whatever we like here, haha. Oh, thanks for clearing that up! I guess it just reminds me of some other games and stories that focused too much on audience. My bad if I seemed discrediting, I didn't mean to come off that way. I'm sure lots of work and original ideas went into this project; I also did not know there was an original that already had a fanbase-once again-, my bad. I probably should've done more research. I apologize if I seemed accusatory, that was not my intention, aha. Again, I wish you the best of luck in development, I'm sure people will love it! It's alright! XOBD isn't exactly a timeless story. If you don't know our company it's understandable that it might seem like it must exist for a specific niche. But, in the end, it's for our personal amusement in a way that's meant to not follow through with the hopes of people who follow us. Not only is it a wide margin off from what people had been looking for from this series, we released another game called Lake of Voices which a horror-tragedy where every death is miserable/heartbreaking. A lot of fans of that were asking for a new horror game from us, while others were waiting for that original XOXO Droplets sequel. And XOXO Blood Droplets is what happened; a game where everyone's favorite XOD characters are insane and where dying is entertainment instead of emotional. Tonal whiplash and the unexpected is what we're about, haha. Thanks again for playing the demo. Not everyone is into the same stuff, but we wouldn't get anywhere without people at least giving our games a try. Perhaps Lake of Voices would be more enjoyable for you. The artstyle is much more detailed and the characters are far more down-to-earth. I'll try it out sometime, thank you so much! 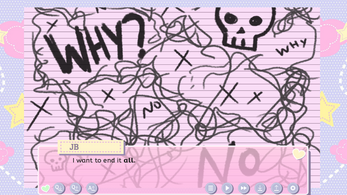 You'll get the XOXO Droplets key right away, haha. It'll only be the XOXO Blood Droplets stuff that you'll have to wait for. Thank you for taking an interest in our games! this is so weird, my little angel bean Shiloh acting like this right off the bat, but you know what? I'm living for it. Also, he unintentionally said my username. Haha, that's a fun coincidence. I hope you continue to enjoy Shi in this game. He's a bit of a cad. WARNING THIS GAME IS FOR Misunderstood TEENS, Nerds going through a weird time in their mid 20s & Parents who pretend not to like this stuff ONLY! ;) tehe. Thank you for checking out the demo! The first game is so fun!!! Thank you so much ^^! I thought this was a cute game. I loved a lot of the remarks MC made. 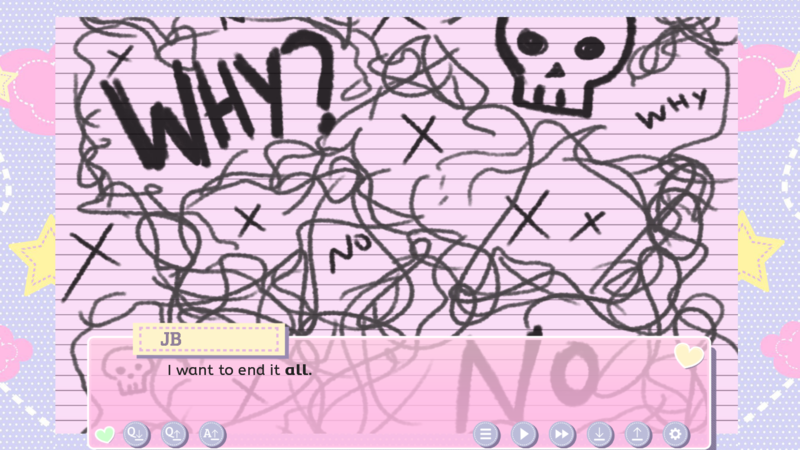 The comedy was really witty in this visual novel. Now i'm going to have to play the original droplets to see what's in store with that! Thank you very much! I'm really glad you thought it was funny. Just started it, but its right up my alley, love it already! Haha, thank you very much for making a let's play! I'm glad you're getting a kick out it. Haha, I'm so glad to hear that! I was worried if the game might not have a good balance of being approachable to new players, while having fun nods for those who knew the original. Thank you very much for the very kind comment. We'll be sure to keep working on this game and get it out there! Aaw, thank you so much! I'm happy to hear that you enjoy the crazy versions of these boys, haha. 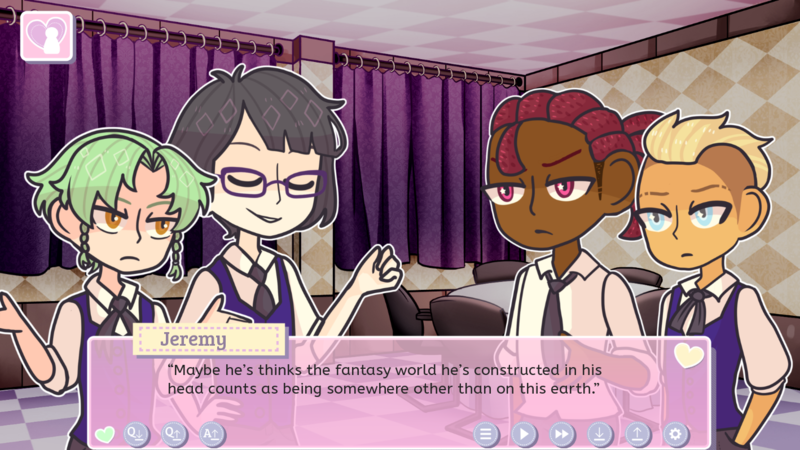 We'll do our best to get the game finished and released as soon as we can! 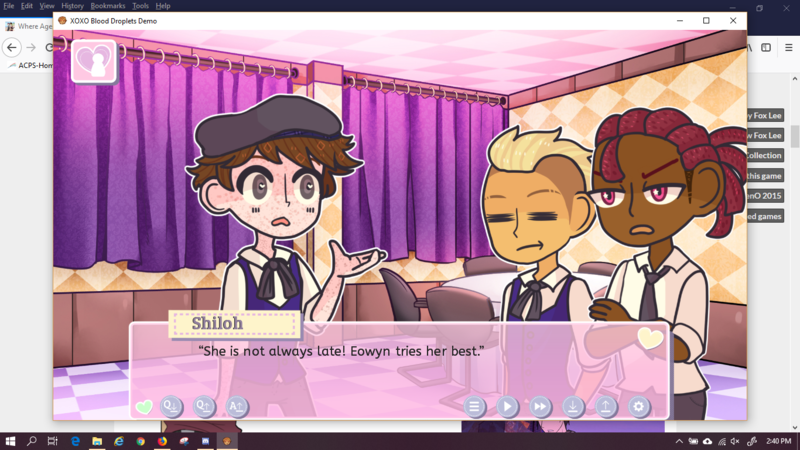 Is it just me or is Shiloh acting like Monika? Haha, I suppose in some ways they're two of a kind. Hi! 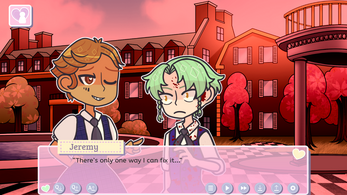 I really enjoyed the previous game, Jerebear lol, and I was wondering if there was an approximate release date for this game and the what the estimated cost of the full version would be. Thank you for your time! Thank you! I'm glad you enjoyed the original XOD game ^^. 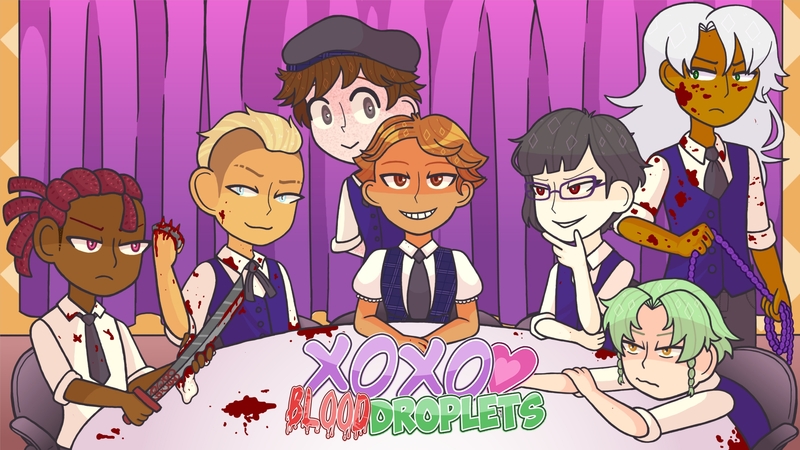 XOXO Blood Droplets is scheduled to come out in 2019. The price will be around 10+ USD. 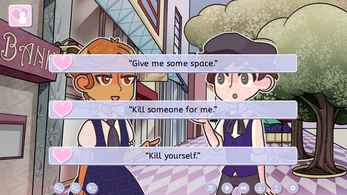 There are two routes, Pran and Nate, plus an option to not be interested in any of the choose-able options. There are 8 bad endings and 3 'to be counted' conclusions. 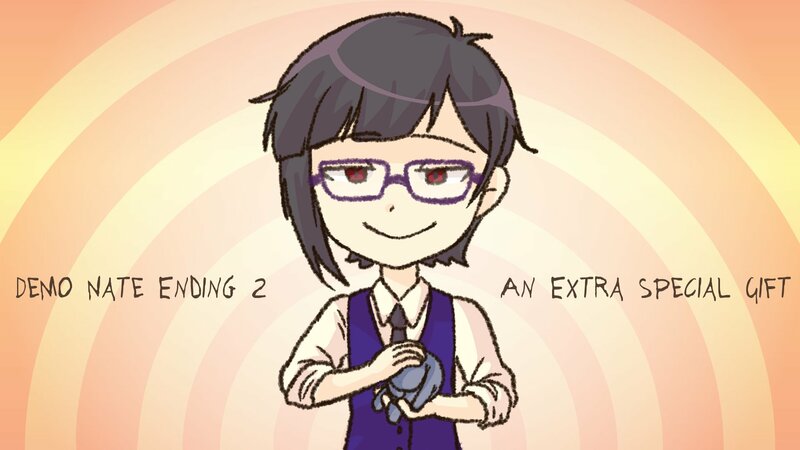 If you click the Extras button on the main menu there's an Ending list, which will keep track of all the endings you've gotten in the demo. Good luck! My last video! I'll go through everyone else by myself. Loved the game. The dark humor was great. Can't wait for the full game. How do I get the last ending with Nate? It's going to get crazier from here; I know it. Thanks for sharing those here! Haha, I'm glad you seem to be having a good time. And yeah, things only get crazier the further they go on. Totally forgot to post these! I love it! specially how their personalities are intensified to the extreme! XD But dang! just two days seem crazy in their world, it's a true wonder how JB managed to stay alive and 'sane' (well enough) for a whole year. Haha, thank you! JB has certainly been very lucky. But I guess she's not the only one who's gotten impatient recently. Thank you! Haha, we're glad you had fun with the crazy version of those jerks. We'll do out best to get the full version out soon!